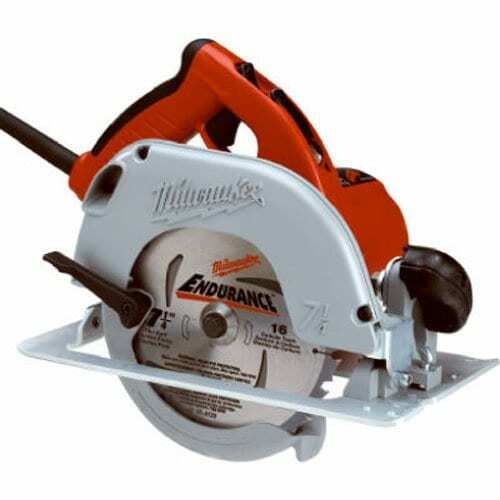 The Milwaukee 6390-21 power circular saw model is my personal choice because it is backed up with a name that is well-respected in the industry. It also comes with dependable features that allow for precision and accuracy of cuts. We understand how difficult it is to make a sound decision when purchasing. As such, we have come up with this review so that you can take a look at each of the features offered by this model, and make a well-informed decision in the end. What Makes a Good Circular Saw? 4. Makita HS7600 Circular Saw, 7-1/4"
As someone working on DIY projects at home, I felt the need to have my own toolkit ready all the time. A power circular saw is something that I know I should have, because unlike a standard saw, it has the capacity to perform better and more precise cuts. These reasons made me decide to get one. Aside from being able cut with precision, choosing the right circular saw makes possible for accuracy in depth, as well as other intricate procedures in cutting different types of materials aside from wood. How I wished I have known about the Milwaukee 6390-21 7-1/4-Inch 15-Amp Tilt-Lok Circular Saw when I was looking for a circular saw the first time. This model comes with several features that make it ideal for different types of cutting tasks. A power circular saw such as the Milwaukee 6390-21 model is perfect for woodworkers, both professional and beginners who are looking for the benefits offered by a power tool over a manual one. Aside from working with wood, this circular saw can also handle other types of materials that need to be cut with precision. This power tool should be included in the toolkit of any woodworker. Compared to a manual equipment, this power tool offers convenience because you no longer have to adjust in order to see precision in the output of your task. As such, it is also good for more intricate cutting needs. Most models of power circular saws are designed with portability in mind. As such, they are easy to bring wherever you want to go. This is also beneficial especially if you only have a limited space for working with your tools, as you can easily fit this tool in a small space. One of the most obvious benefits offered by a power circular saw compared to a manual one is convenience. While a manual saw may need more hard work and physical labor, a power circular saw will allow you to finish a job faster. As such, this type of saw can save you energy and time compared to a manual hand saw. A circular saw is designed with precision in mind. For instance, the vertical cut angle may be adjusted from the standard 90 to 45 degrees, or any in-between angle. Even the cutting depth can be pre-adjusted as well. This means that the moment you use the saw, you can already expect the quality of the output. One thing is for sure. You will find a number of options on power circular saws on the market. Choosing the best one for your needs can be challenging. However, by taking into consideration the following features, you can still end up with a model that is ideal for you. There are different types of circular saws that you might encounter on the market. You can choose from worm drive, sidewinder, small sidewinder, cordless, as well as a trim saws. Each of these types offer their own set of benefits and drawbacks. Choose one that will fit not just your needs, but your preferences as well. One thing that you need to realistically anticipate is that there will come a time that you will end up dropping your saw. Choose a circular saw that is equipped with raised reinforcing ribs located on the top, as they will not bend as compared to flat aluminum shoes when hitting the ground. On top of that, a cast metal shoe may add more weight to the circular saw. Smooth cornered, bigger lever locks as well as full-round knobs which may be tightened down using the entire hand are often more convenient, because it becomes easier and faster to adjust the cutting depth, as well as bevel settings compared to hard-to-grasp, small wing nuts and levers. The Milwaukee 6390-21 circular saw is easy to use and durable at the same time. It is powered with a 15 amp motor, featuring 3.25 HP. One of the most standout features of this model is the use of a Tilt-lok handle which offers control and comfort as you work. This 7 ¼ inch saw is a smooth starter, evenly cutting wood, while handling any type of material easily. It is also very lightweight, and equipped with an 8-position Tilt-lok handle which offers maximum control and comfort. It even has a single-touch spindle lock button, making the replacement of blades extra easy. This model even comes with very simple bevel adjustment settings, easy access depth, as well as a complete 50-degree bevel capacity. It even has a clear line of sight, making it very simple to achieve accuracy in cutting every time it is used. This saw is equipped with a Tilt-Lok handle. This handle has eight positions which can easily adjust to your application in cutting. It also offers you maximum control and comfort. It is a revolutionary concept that can help you work easily, as it allows the main handle to adjust to the type of work that you need to complete, giving you the most comfortable position while working. This power circular saw comes equipped with 15 amp motor rating, with 3.25 peak HP motor capacity. As such, it has the capacity to easily cut through different types of materials including microlams, headers, as well as wet lumber. This tool has the capability to bevel up to 50 degrees, while offering superior visibility, as well as a clear line of sight from each side. The Milwaukee 6390-21 circular saw is also equipped with features that ensure its overall durability. For example, it uses helical steel gears, alongside a 22 amp switch – two features that make this tool built to last. The quick field replacement feature offered by this circular saw is made possible by the use of a spindle lock as well as a quick-lock cord. This is pretty useful especially if you have a lot of things to do, and you barely have enough time to replace blades in between tasks. This model comes equipped with a quiet motor. The motor is powerful enough to easily cut different types of materials. It has the capacity to nicely glide through, making straight cuts. The cord of this model is not grounded. It has to be set at the lowest setting angle in order to easily fit inside the case. One customer mentioned that he purchased this model mainly because it is made by a recognized name in the industry. Aside from that, he admires that this tool can “cut very well”, as it is equipped with great blades that are carbide tipped. The line is easy to follow, thus making every cut precise. Another customer described it as a “cutting edge saw”. He tried it on different types of wood, particularly cedar, pine and oak. According to the customer, the saw is powerful, terrific, and solid, without unnecessarily being heavy. The calibration marks are also accurate and clear for depth. Since the base plate is made of aluminum, the weight is kept down as well. Not all customers give positive feedback, however. For instance, one mentioned that the case is big, which means that it can take too much space. Another also wished that this model could have had a blade brake as well as a rip guide. These are fairly minor responses, compared to the positive ones given by most customers. The DEWALT DWE575 is a corded circular saw. The manufacturer of this model has redesigned their circular saw recently, focusing on reducing its weight, while making some improvements on certain features. This is one of the lightest circular saw out there, designed for cutting plywood, framing material, trim materials, and several others. Even though it may be small and lightweight, it is packed with amazing features, including its cutting depth and a 57 degrees beveling capacity, often considered better than other models. The Hitachi C7ST circular saw is designed with 24 blade tooth, perfect for making rough cuts. It is not just great in giving you precision in making 90 degree cuts, but it can also create bevels that range from 0-45 degrees with several types of materials. Among its strong selling points include a 6,000 RPM blade speed which results to faster, smoother, as well as burn-free cuts. This model is designed to easily rip through materials such as marble, tiles, concrete, granite, brick, as well as other similar types. The PORTER-CABLE PC15CSLK is a circular, corded saw which comes with some unique features. For example, it comes with an integrated laser cutting guide which is useful when creating long and straight cuts. It also has an outfitted design and kerf cut indicators which makes it possible to make accurate line cuts. On top of all the features that this saw offers, it is also equipped with soft grips for its rear handle. Alongside its 10 feet power cord, there is no need for you to use extension cords. As presented in reviews, this model is powerful enough to deal with different wood types, with a sound level that is acceptable. The Makita HS7600 circular saw comes equipped with a powerful 10.5 amp motor which delivers up to 5,200 RPM speed performance as well as durability in the job site. It is designed with a huge cutting capacity of up to 2-1/2 inches (90 degrees), as well as 1-5/8 inches (45 degrees). Its lightweight and well-balanced design makes it ideal for superior performance and handling. Another feature that ensures the creation of straighter cuts is the heavy gauge base of aluminum wraparound which is also engineered to offer improved durability. The SKILSAW SPT67WM-22 circular saw is backed up with the reputation of its manufacturer. It is designed as a lightweight and fast-cutting tool, equipped with enough power to cut through thick, dense, as well as wet pressure-treated material, as well as thicker slabs of lumber engineered for different uses. One standout feature of this model is the use of a magnesium footplate, as well as its motor housing, making it both lightweight and durable. It also comes with an on-board wrench storage which is very efficient in changing the blade. The Milwaukee 6390-21 power circular saw model is equipped with features that make it ideal for woodworkers like me who are looking for a reliable tool to add to the arsenal. One standout feature of this model that I appreciate the most is the use of a Tilt-Lok handle. This technology is trademarked under the brand, making it possible for the optimization of control and comfort while working. The handle has eight positions that can be adjusted accordingly to fit your cutting application. With its 15 amp motor rating and capacity, it can easily cut through different types of materials. With a weight of 10.4 pounds, it is very easy to handle, thus reducing fatigue on the user. I also like the fact that it comes with amazing blade visibility from each side, making it easier to finish the task at hand.